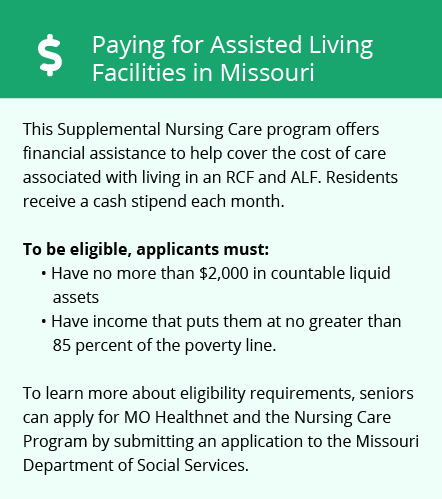 The average cost of memory care in Audrain County is $3,900 per month. This is lower than the national median of $4,655. Caring.com has helped thousands of families find high-quality senior care. To speak with one of our Family Advisors about memory care options and costs in Audrain County, call (855) 863-8283. Approximately 27,000 people reside in Audrain County, Missouri, and nearly 1 out of every 5 residents in this rural community are seniors. Some of these seniors require around-the-clock care due to Alzheimer's disease, a condition that affects an estimated 110,000 Missourians. Audrain County has approximately 10 memory care facilities for residents with conditions such as Alzheimer's and other forms of dementia. These memory care facilities are called assisted living facilities or residential care facilities, and they offer compassionate care day and night for seniors. Audrain County, Missouri, is home to world-class medical facilities, including those specializing in brain health and dementia care, such as the St. Mary's Hospital, in the event of medical emergencies or illness. Seniors may feel safer in Audrain County than they do in larger counties, such as Saint Louis County and Saint Charles County. The crime rate in Audrain County is higher than the national average, based on a crime scale where 0 equals a low crime rate and 100 equals a high crime rate. Seniors seeking an area with a lower crime rate may want to choose a memory care facility in nearby Boone County, Callaway County or Ralls County. Audrain County, which includes Mexico, Vandalia and Farber, typically has cold winters and hot summers. Seniors with respiratory issues may struggle during humid summer days, but the humidity often improves by autumn. Throughout the year, temperatures generally range from the low 20s to the high 80s in Audrain County, though they occasionally fall below zero or hit triple digits. Seniors living on a limited budget may appreciate that Audrain County has a lower overall cost of living score than both the U.S. average and the Missouri average. The city has a score of 80 on a 100-point scale, with the national average totalling 100. Costs for housing, utilities, transportation and groceries all typically fall below the national average, but health-related expenses are somewhat higher. Memory Care costs in Audrain County start around $3,900 per month on average, while the nationwide average cost of memory care is $4,799 per month. It’s important to note that memory care rates in Audrain County and the surrounding suburbs can vary widely based on factors such as location, the level of care needed, apartment size and the types of amenities offered at each community. Audrain County and the surrounding area are home to numerous government agencies and non-profit organizations offering help for seniors searching for or currently residing in an assisted living community. These organizations can also provide assistance in a number of other eldercare services such as geriatric care management, elder law advice, estate planning, finding home care and health and wellness programs. To see a list of free memory care resources in Audrain County, please visit our Assisted Living in Missouri page. 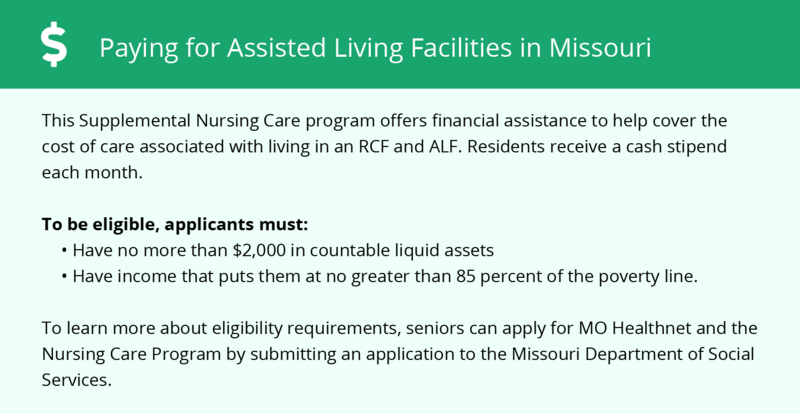 Audrain County-area assisted living communities must adhere to the comprehensive set of state laws and regulations that all assisted living communities in Missouri are required to follow. Visit our Memory Care in Missouri page for more information about these laws.